The Freshwater jellyfish originated in the Amazonian forests of South America and are currently found on all continents of the world, except perhaps Africa. The freshwater jellyfish usually gets transported along with shipments of plants and animals and finds itself in a new habitat. This unwilling transportation is possibly the reason freshwater jellyfish are found in abundance in most parts of the world. Freshwater jellyfish can be found in freshwater lakes, reservoirs, man-made impoundments, water-filled gravel pits, rock quarries, algae-filled ponds, and rivers. 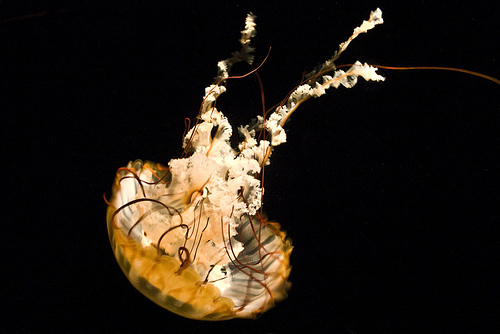 Unlike their marine counterparts, freshwater jellyfish do not like currents and tides and prefer standing water. This is why they are not usually seen in fast flowing streams or rivers. They can have as many as 400 tentacles at the margins of their bodies. The tentacles have a number of nematocysts, or stinging cells, that are capable of injecting venom into a prey to kill or paralyze it. However, these nematocysts are not powerful enough to break into human skins, and so, humans don’t feel any sting from the freshwater jellyfish. This entry was posted in 5% acetic acid/Vinegar on jelly stings, Box jellyfish, Cannonball jellyfish, florida-jellyfish-portuguese-man-of-war-florida-beaches-long-island-beaches-hawaii-waikki-oahu-guam-austalia-stingersmauve-jellyfis-pelagia-nortiluca-black-sea-nettles-stingrays-sport-fi, Irukandji, jellyfish, jellyfish species, jellyfish sting first aid, Jellyfish sting remedy, jellyfish stings, Jellyfish stings, vinegar, acetic acid, Lion's mane jellyfish, Man of War, marine sting first aids, marine stings, Pacifici coast sea nettles, Pelagia Nortiluca, sea nettles, StingMate, Uncategorized, Vinegar on Jellyfish stings. Bookmark the permalink.